After two weeks of tension boiling hot among hundreds of former and current AIPP members, the Institute has yet to respond to what has developed into a troubling situation. The AIPP Board is currently considering how to address the schism. However, a scheduled monthly board meeting took place on February 15, and with this topic ‘high on the agenda’, it’s possible a response isn’t far off. 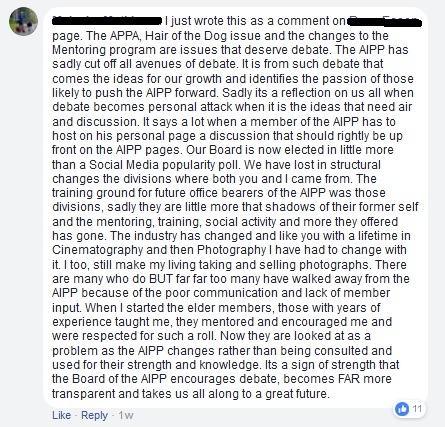 Frustration from senior AIPP members and former members has been condensed within a Facebook (FB) status by AIPP Grand Master photographer, David Oliver, on his personal FB page. However, there are other ‘spot fire’ postings on social media tackling a broad range of issues. The story so far: On January 29, David Oliver posted about long-term AIPP Awards contributors Tony Hewitt and Peter Eastway being dropped from the Awards Team, after a decision was made ‘for what I can only see as a purely a business move by the (AIPP) Board under the guide of Peter Myers’. David made the post as a reaction to what he saw as the censorship on the closed AIPP FB Community Group, where comments critical of the Institute were being removed. Eventually, commenting was entirely disabled. ‘Our AIPP members could lose two amazing judges, panel chairs, and mentors to our young upcoming judges who value there experience,’ an excerpt of David’s status says. ‘Who could blame Peter and Tony if they were to make such a decision. And if they did so I would fully support them. 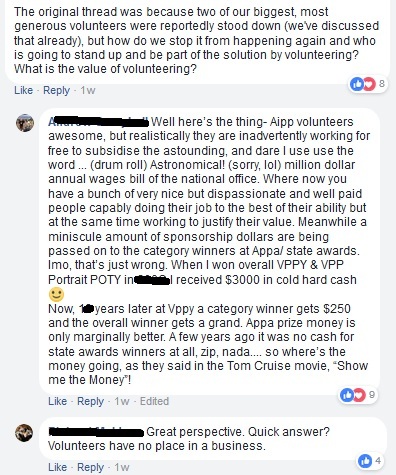 ‘One can only be left wondering as to why Peter Myer’s post on the AIPP members Facebook page regarding the “New AIPP Awards team” is being vetted. 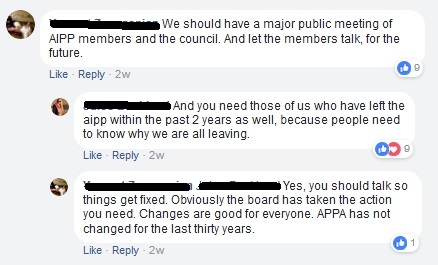 (AIPP Grand Master and APPA judge) David Paterson’s post in response was deleted within hours, after he made comments about the inaccuracies of the post particularly in reference to…” Tony is happy to step aside” which is blatantly untrue and a poor reflection of the Board to say such a lie to the membership? …It is not a privilege but a right as a member to have freedom of speech! 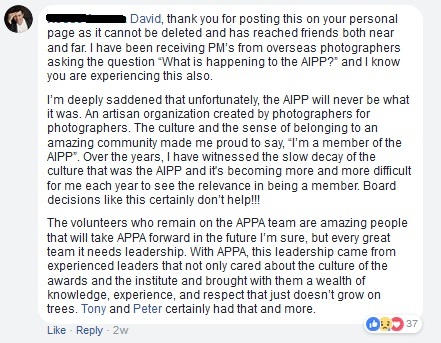 Many photographers, including this previous APPA chairman and AIPP Grand Master photographer, are baffled or upset that the AIPP Board didn’t attempt to retain two senior volunteers and experienced judges. The departure of Tony and Peter has served as the catalyst – and perhaps the final straw – prompting former and current members to vent frustration. The two senior volunteers disagreed to restructuring the Awards administration system, and no longer hold their positions at the AIPP. These two individuals alone have contributed countless hours of their time to the AIPP over decades. The incident has, more broadly, revealed widespread unhappiness about how the Board has handled this and other matters. An unprecedented number of former members, many highly successful award-winning photographers and contributing members, have come forward to list reasons why they didn’t renew their membership. The David Oliver post remains active and hundreds of comments have been published. The photographers posting critical assessments of the Institute include senior AIPP members, Grand Master photographers, past presidents, state councillors, award-winners, and mentors. That is, they are not merely a group of rabble-rousers or chronic malcontents throwing pies from the sidelines. There’s a desire among this group to reach a solution which will reunite former members with the AIPP, while maintaining initiatives to benefit existing and new members. Here’s an excerpt from input by Tony Hewitt, one of the key players in what is emerging as a schism in the professional photography community: ‘The level of response from so many different parties has extended to a broader range of interests and concerns beyond the recent changes to the Awards Team structure, and so many have shared their feelings, observations, & dissatisfaction with the current state & direction of the AIPP. 1. A large number of high profile AIPP members have recently left including Grand Masters, award winners, former board members and presidents. Is the AIPP documenting why these members are leaving the Institute? What are the primary reasons for their departure? 2. Is the AIPP exploring ways to bring these members back? 3. 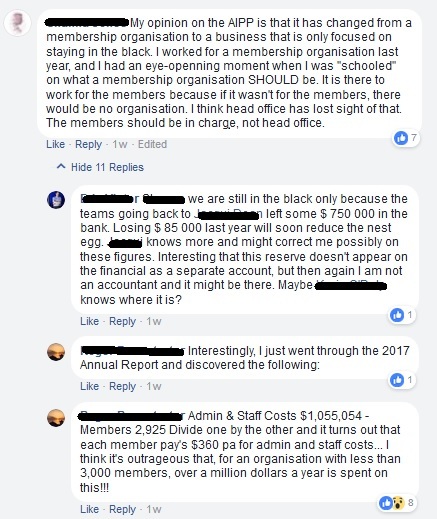 David Oliver’s Facebook post reveals there’s literally hundreds of unhappy members or former members, who are demanding the AIPP National Office or Board address their concerns. Will the AIPP do this, and if so when and how? 4. Is this a crisis situation for the AIPP? If not, how should it be described? 5. Many former members feel there is a lack of communication and transparency between the AIPP Board/National Office and members. Do you think there is room for improvement in communication to members? If so, how could this be achieved? 6. Does the extensive use of Non-disclosure agreements suggest the AIPP has information it wishes to withhold from members? 7. Two weeks have passed since the AIPP president’s letter, but tension is still high. Does the AIPP board plan to issue another perhaps more informative response to members? 8. Centralising power to the AIPP National Office, while dismantling State Council initiatives and programs, has been a criticised strategy. Does the AIPP stand by this strategy, despite the apparent backlash it has received from, among others, the QLD Council? 9. Admin & Staff Costs have increased to be over $1 million last year, according to some critics, while membership revenue was $859,331. Is having such high costs to run head office a sustainable model? Are there plans to further increase staff numbers in the executive office? ‘The Board and management are well aware of and are concerned about these issues, and have met many times discussing them. However over the past two years, only two formal approaches from disgruntled members have been made through appropriate channels. ‘The AIPP Board, made up by volunteer members, will continue to consider the situation. The AIPP has incrementally centralised power to the National Board and Office, which has expanded and consequently become more costly to members. Centralisation wrested control away from the State Councils, which had operated almost independently and relied heavily on volunteers. As centralisation pulled control away from State Councils, which operated independently through volunteers, they had less influence over organising events, such as the State Awards. Restructuring the State Awards and APPAs, two major events, are prime examples of the kind of centralisation which have caused concern among members. A former state president explained to ProCounter that during his tenure, ‘head office’ had minimal involvement with the awards. State Councils generated income through awards and events. According to a reliable and respected source, one state group had over $40,000 in the bank. Yet State Council autonomy was also dangerous, with some states running at a financial loss, forcing the National Office to dip into its funds to bail them out. The national office – the Board and the executive officer – began to offer management support to co-ordinate volunteers and help run the events, aiming to reduce unnecessary spending. Among other changes, such as using only national office-approved approved judges, the State Awards were also tweaked to become a stepping stone to the national awards, the APPAs. Procounter was told that volunteers who built the event were delegated menial tasks like moving chairs and providing refreshments, and so many stopped putting their hand up to help. Many photographers commenting on David Oliver’s FB status claim that restructuring the awards and removing State Council influence damaged the integrity of the State Awards. The State Award’s foundation was built on the back of volunteers and a sense of community, but many perceive this to have disappeared under the new way of doing things. The AIPP attributes falling numbers of volunteers to the next generation of photographers, who it claims aren’t willing to volunteer their time as freely as previous generations. ‘Organisations reliant on volunteers around the world are in trouble, because those willing are no longer there,’ he told ProCounter in April last year. The ‘new direction’ of the AIPP resulted in expanding the National Office – employing and paying for more staff. Two photographers published figures from the 2017 Annual Report. Apparently Admin and Staff costs increased over $100,00 from 2016 to 2017, to equal over $1 million – $721,500 in employee benefits and training, plus $333,554 in administrative costs. Meanwhile, membership subscriptions generated $859,331, which isn’t close enough to cover the cost of staff. While it can be argued the increased Admin and Staff costs are necessary, some members feel they are excessive, and believe willing volunteers have been pushed away. Former members claim that appointment to positions of authority at the AIPP has essentially become a social media popularity contest. Previously it required an experienced individual to move through the ranks and ‘put in the yards’. ‘Traditionally, the path took one from a state representative to Board member, vice president to president and finally to chairman. A chairman, therefore, had the longest experience and acted as the safe keeper of our association, its ideals and its “culture”,’ wrote Eric Victor, former AIPP president, in another Facebook posting. ‘This progressive education of the management teams ensured continuity and the clear understanding of what we are about. It has unfortunately been replaced with an unconnected and inadequate structure which heavily relies on a rigid, expensive and centralized administration team. Others also pointed out the high number of co-opted – unelected – Board members. AIPP Board member, Louise Bagger, speaking as a member and not on behalf of the Board, responded to Eric saying that the ‘erosion of the old structure’, to her is ‘constructive redevelopment’ reflective of societal and industry change. Chris Shain, AIPP senior member and Board advisor for copyright, agreed the Institute cannot stand still while the world around it changes. The consensus is that the Board has a tough job, and while the goal is to do right by the Institute, many think it’s current strategy is heading in the wrong direction. 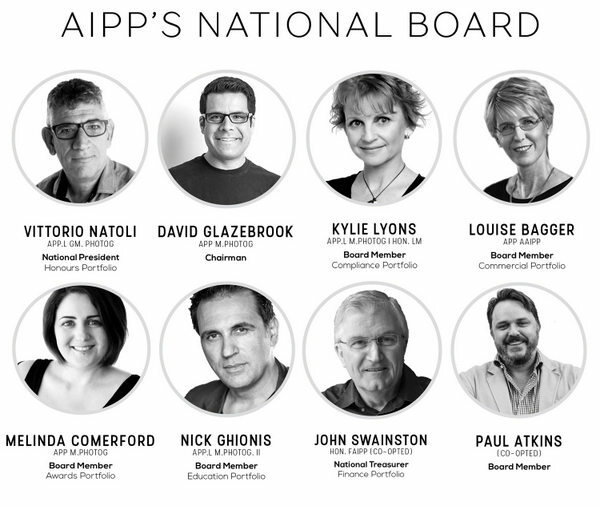 Finally, there have clearly been communication problems between the AIPP Board and members. The AIPP Community FB page is where most members connect, and is the primary channel for communication. However, it’s not a place where complaints can be heard, and has become problematic for the AIPP. Support ProCounter by subscribing to our free fortnightly e-mail newsletter! AIPP national office closed today. Board resigned. Seems that what goes around, comes around – given time!